In this, the second in a series of features written for Keith Mallinson (WiseHarbor) for IP Finance, the author has some more positive points to make concerning (F)RAND licensing, pointing to its huge success so far in boosting technology and reducing prices in the mobile communications sector. Keith also explains the role of the Herfindahl-Hirschman Index in measuring competition within a market, showing how favourably this sector compares with those in which there is no such norm. IP licensing arrangements have promoted—not inhibited—superlative market developments in mobile communications. I quantified the enormous success of mobile technologies, including GSM with more than four billion users and WCDMA with a billion subscribers expected this year, in my previous IP Finance posting (here). The rate and extent of market growth exceeds adoption of any other consumer electronic product including radios, TVs, VCRs, DVDs, digital watches and pocket calculators. Mobile technology licensing agreements on the basis of (Fair) Reasonable and Non-Discriminatory terms have ensured licensing of standards-essential technologies to all comers, with the vast majority of the IP owners willing to make (F)RAND commitments. Similarly, (F)RAND-based licensing has also been highly effective with video and audio codec technologies, including the MPEG standards, which are incorporated in all DVD players. Perversely, there are significant moves afoot to redefine, or even replace, the prevailing system of licensing standards-essential mobile technologies on the basis of (F)RAND. A recent Federal Trade Commission report on the "Evolving IP Marketplace" airs complaints that (F)RAND is ill-defined and references demands for injunctive relief to be withdrawn from (F)RAND licensors. A popular refrain from detractors, including antitrust complainants, is that such licensing practices “stifle innovation and harm consumers”, or words to that effect. In contradiction to these unproven suppositions, in the real world of mobile communications, video and audio devices the stellar market growth quantified above, extensive technical and commercial innovations, significant competition and tumbling prices indicate an effective and efficient market. Consumers, in particular, are benefiting enormously. Redefining or replacing (F)RAND could undermine commercial incentives and deter many innovators from contributing to standards development. That would harm this vibrant market. Successive generations of mobile technology have increased massively in performance with end-user data rates increasing 1,000-fold in 20 years. 2G GSM initially provided users up to 56 kilobits per second with GPRS in the mid 1990s and 3G WCDMA provided up to 384 kbps in the early 2000s. Improvements on the latter, with introduction of HSPA and LTE technologies have already increased peak user speeds to several tens of megabits per second. In addition, new research from UK regulator Ofcom shows that LTE will provide 2.3 times the network capacity achieved by existing 3G technologies while using the same amount of spectrum, rising to a 5.5 times gain by 2020. Other standards-based innovations have substantially improved voice encoding, reduced power consumption, and enabled multimedia messaging and location tracking. An unprecedentedly large and increasing amount of patented IP from among dozens of patentees is required to implement mobile communications in comparison to other standards. Whereas around 561 patents families were declared as essential, according to Fairfield Resources International, in the standardization of GSM with commercial service launches from around 1993, this figure increased significantly with the subsequent technologies. According to the database of the European Telecommunications Standards Institute, more than 4,000 IP declarations have been declared as potentially essential to LTE. These technologies and associated network services provide the shoulders upon which “smartphone” devices, such as Apple’s iPhone, can provide a communications-intensive user experience with a variety of software applications. Research and development from a wide variety of technology companies continues unabated in creation of standards-essential and other IP for mobile communications. 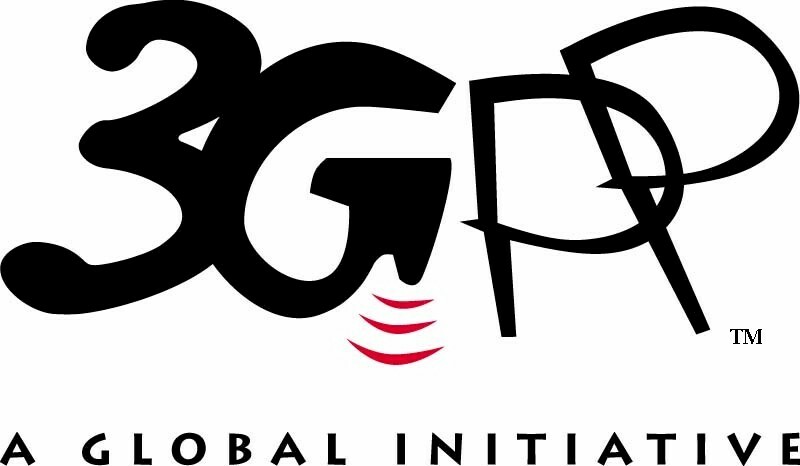 The 3rd Generation Partnership Project (3GPP), including ETSI and other standards organisations worldwide, is currently working on its 11th major standards release. According to Adrian Scrase, VP International Partnership Projects, 3GPP, speaking at the LTE World Summit in Amsterdam recently, the rate of standards development since Release 8 for LTE in 2007, with commercial services using that mobile broadband technology since year-end 2009, is being maintained. Ongoing standardization work includes convergence with fixed networks, internet protocol voice and machine-to-machine communications, as well as ever faster data speeds and network capacity improvements. The markets for mobile phones and the “baseband” communications processor chips they incorporate to implement the communications standards are very competitive. Despite the high level of patented technology incorporated in mobile communication devices, there is an ever-increasing number of manufacturers. Market share is spread much more widely than in some other IP-intensive technology markets that are not subject to (F)RAND licensing conditions, including PC microprocessors and the operating systems (OS) software used in PCs and smartphones. Concentration in market supply can be simply and conveniently measured with an analytical method used by the U.S. Department of Justice and other competition authorities worldwide in their antitrust and merger investigations. 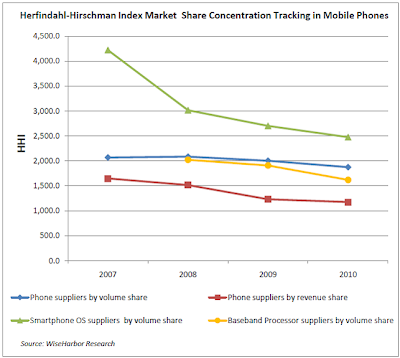 The Herfindahl-Hirschman Index (HHI: see below) is a commonly-accepted technique for measuring market share concentration. The HHI is calculated by squaring the market share of each firm competing in a market, and then summing the resulting numbers. The HHI number can range from close to zero to 10,000. The closer a market is to being a monopoly, the higher the market's concentration and the lower the level of competition. If, for example, there were only one firm in a market, that firm would have 100% market share and the HHI would equal 10,000 (i.e., 100 x 100). Alternatively, if there were thousands of firms competing, each with close to 0% market share, the HHI would be close to zero, representing near “perfect competition”. Handset and baseband chip markets are only moderately concentrated with market share significantly spread across several major producers. The chart shows HHIs in these markets that are around or below 1,800. They are declining due to market disruptions including Apple in phones and MediaTek in basebands who have entered the markets and grown to command 20% shares within five years. HTC has also grown rapidly to be a major phone supplier. Huawei and ZTE have advanced significantly in phones and lead in the supply of data dongles. New device categories including e-readers, such as Amazon’s Kindle and tablets, such as Apple’s iPad, are also disturbing the competitive environment in devices. In contrast, the market for PC microprocessors, which is not subject to (F)RAND licensing, is highly concentrated. Intel and AMD have shares of 82% and 12% respectively with an HHI exceeding 6,500. Similarly, in the predominantly non-(F)RAND licensing of operating system software, Microsoft commands such a high market share in PCs that the HHI is around 8,000. 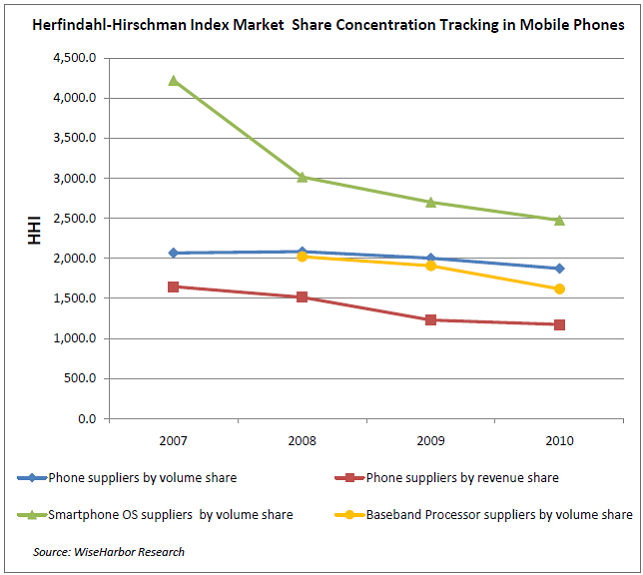 The chart also shows the HHI for smartphone OSs, falling from 4,200 to 2,500 in the last few years. This has resulted from the demise of Nokia’s Symbian with the rise of Apple’s iOS and Google’s Android, the latter enabling multiple handset suppliers to enter the market with advanced smartphones. Prices fall relentlessly in mobile communications; including phones, voice minutes and data services. Global average wholesale phone prices, (i.e., excluding mobile operator subsidies) have declined since 1993, when 2G technologies were first introduced, from $560 to $130-- representing an 8% annual reduction. Meanwhile, a large proportion of devices sold were first enriched with text messaging, then with Swiss Army-like functionality including polyphonic ring tones, colour screens and cameras from the early 2000s, and most recently with smartphones functionality incorporating the computing power of PCs or games consoles such as the Xbox 360, launched only six years ago, to provide internet access, video streaming, on-line access to apps libraries, MP3 audio and MPEG camcorder functions. The average price per voice minute, in the U.S., for example, has plummeted from 75 cents in 1993 to less than 4 cents today-- equivalent to a 16% annual reduction. In my opinion, price reductions per megabyte of data consumption will be even more dramatic with latest technologies and exponential growth in demand. Despite all the positives above, some complain that royalties are excessive in comparison to other costs. In my next article for IP Finance, I will evaluate the value share received upstream in royalties in comparison to downstream rewards in manufacture of handsets and provision of operator services".